The coordination of slow movement and deep relaxed breathing helps explain the medical research findings that the Tai Chi martial arts form promotes blood circulation, increases the oxygen level throughout the body, and enhances the body's healing systems. Tai Chi has a reputation not only for being safe at any age, but also of slowing the aging process itself. Through the use of split screen, Grandmaster Chen makes it easier to understand correct positions for hands and feet. ... In addition, he counts out each of the movements to correspond with the pictures in his books. In its many variations, the Yang style Tai Chi form (exercise) is the most widely practised in the world. Grandmaster Chen is one of the world's preeminent teachers of Yang Tai Chi. ... He is a senior disciple of the legendary grandmaster, Professor Cheng Man-Ching, who studied with Grandmaster Yang Chengfu, a pivotal figure in making Yang-style the most popular Tai Chi form practiced today. Yang Chengfu was the grandson of Yang Lu-chan, the founder of the Yang style. Grandmaster Chen goes through first portion of the Yang short form with step-by-step instructions and advice. 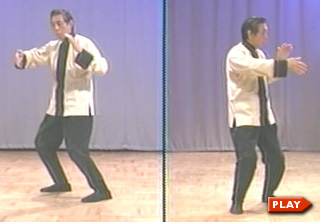 He shows how to achieve the exercise's rhythmic relaxation and energizing through the use of imagery (like a bird ready to take off), ... the alternating focus on pinky fingers and index fingers, the switching between tilting the body and straightening, and the importance of coordinating spinning motions and breathing in and out. Grandmaster Chen explains the changes he made to Professor Cheng Man Ching's form and summarizes the basics of doing Tai Chi. ... The transmission of energy from the toes and inner thighs, through the rib cage, and to the fingers is outlined. Grandmaster Chen explains the position of the legs, how weight is distributed, the "three nails" of the feet, and the importance of the big toe. ... He uses toy boxers to illustrate how the inner thighs play their part and elaborates on how he made Professor Cheng Man Ching's form a little "sweeter". Grandmaster Chen explains when to tilt and the difference between keeping the body straight versus upright. ... He explains why he added "needle at the bottom of the sea" (from the Yang Long Form) to the Short Form. 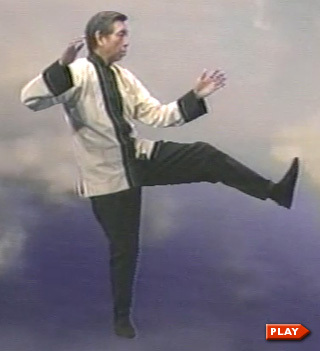 Finally, he demonstrates how the Tai Chi kick requires energizing the fingers ("breaking the chop sticks"). Grandmaster Chen and Sifu Nils Klug go through the first portion of the Yang Short Form (with a nice Sitar background). Then Grandmaster Chen explains the relationship between slow, calm movements and martial arts. ... Then he shows how speeding up particular moves of the Tai Chi form leads to an effective jab, cross, hook, roundhouse, and uppercut. Grandmaster Chen explains and shows how the breathing pattern (inhale and exhale) naturally follows the alternating increase and decrease in the Tai Chi form of mental awareness ("waking up and falling asleep" by collapsing, sinking, and sagging). ... He demonstrates the role of the big toe, ball of the foot, and heel (the "three nails") in movement and creating spin from the ground. However, compared to versions generally taught, my 60 movements are slightly higher in stance and smaller in step. This difference is intentional. In the slow motion of Tai Chi Chuan, body weight is mostly on one leg. If the student is relaxed, as he/she should be, their weight tends to sink down. As a result, it may cause fatigue and exhaustion in the legs, which leads to an unconscious upper body tension. Ultimately, this might affect the smooth inner qi energy flow and body coordination. Qi is an action energy that is directed by the awareness in the brain. Fingers and toes are the remote objectives of the brain. The awareness rises, the toes crunch against the floor and the fingers spiral outward. The Chinese acupuncture diagram refers to the big toe and the thumb as part of the brain. I call the top of the head “brain No. 1,” the big toe “brain No. 2,” and the thumb “brain No. 3.” These three brains are the dynamic source of human action. In the slow motion of Tai Chi Chuan, when the awareness brain is rising, the qi inflates and fingers move as the toes crunch. That is the central point of my 60 movements. The toes crunch, arms float, fingers move and body follows; it appears as if the fingers are dancing. Therefore, I have referred to these movements as “Finger Dancing” for the past 40 plus years. Crunching the toes builds up the toes’ strength which helps us to walk, run and jump. It is very helpful to seniors for maintaining or regaining their walking ability, stabilizing their balance and reducing the fear of falling. Strong toes make the legs strong, which enables an 84 year old like me to teach all my classes. When I teach for 5 or 6 hours in my annual domestic and oversea workshops, I never feel the need to sit. Also, I am very happy that I am still able to walk up the 10 floors in my building every day without depending on the elevator. Life is never happier than when one can live independently without depending on help from others. In addition, the toes crunching against the ground creates a strong jet stream of oxygen-enriched blood (氣血), which raises the circulation level in the toes. This may be considered as a treatment or prevention of diabetic disease. At the same time, it optimizes the energy in the brain that helps our memory, thinking and learning. Furthermore it animates the motion energy qi to accomplish our daily physical activities. Those who practice for general health will improve the oxygen-enriched blood level in the brain. This boosts the force of qi, which runs throughout the body’s meridians, resulting in good health and longevity. The Yang Short Form, shown here, is slow, gentle, even flowing and relaxing. It is the most popular Tai Chi style because of its a reputation for being excellent for stress reduction, self centering and living a more enjoyable life.